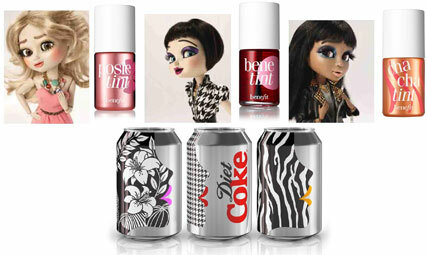 The dreaded post-party “Banuary” has been given a glam update for 2012 thanks to a collaboration between Diet Coke and Benefit cosmetics. Get Glam is a collection of three limited edition cans, each featuring an uber-pout inspired by Benefit’s hero products: Benetint, Posietint and Cha Cha tint. Ruby-lipped True Fashionista is on-trend and stylish, dramatic Rock Chick breaks the mould with a daring orange hue, and girlish Modern Romantic is predictably pink. The trio have already made their debut, and will be sticking around until March. Pick one, drink up, and receive £5 off a £20 order at benefitcosmetics.co.uk. Never has it been more chic to abstain. Bottoms up!